The contraceptive patch is used as a method of birth control and works in a similar way as the combination pill. It contains two hormones, ethinyl estradiol and norelgestromin, which are gradually absorbed into the bloodstream from the patch. Use one patch a week for three weeks. Each patch lasts a week, so you need to change it every seven days. This period is followed by a patch-free week, in which you stop using the patch for seven days. After seven patch-free days, apply a new patch and start again. The patch should be removed and applied on the same day of the week. Contraceptive patches are waterproof, so showering, swimming or using the sauna will not reduce their effectiveness. The contraceptive patch has three main advantages. Firstly, you don’t have to remember to take a pill each day, which can be an advantage for women who easily forget to take the pill. Secondly, the hormones are gradually released into the body, reducing the chance of side effects. And thirdly, the contraceptive patch is still effective if you vomit or have diarrhoea, in contrast to birth control pills. 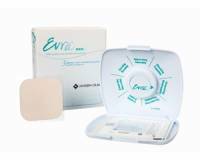 Order contraceptive patches easily and safely via Dokteronline.com. We guarantee fast delivery, without shipping costs and with the option to pay in arrears.